America's wealth tax: It's called property taxes, and they're not very smart. 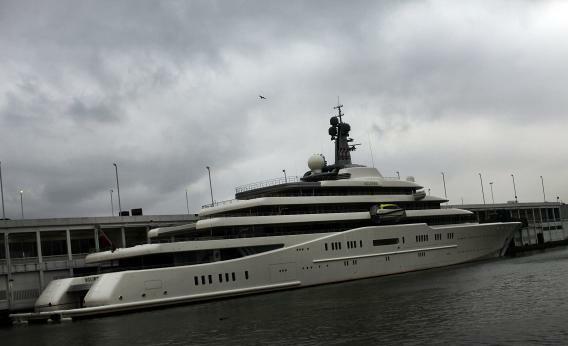 The Eclipse, reported to be the largest private yacht in the world, is docked at a pier in New York on Feb. 19, 2013, in New York City. Wealth is distributed much less equally than income, since if a poor person earns an extra dollar she’s very likely to go spend it on some immediate need (kids need new shoes, toaster broke last month and needs replacing) whereas a rich person will save it. Those savings then generate additional income, which adds to the wealth pile. In light of these facts, Ezra Klein suggests we consider a wealth tax. It’s worth saying that we do kind of have wealth taxes in the United States; they’re just not very intelligently designed. The property taxes that fund local governments, for example, are a tax on housing wealth. It’s just that housing wealth happens to be the most widely held form of wealth in the country, so it doesn’t pack the egalitarian punch of a wealth tax. Another kind of wealth tax is that we levy capital gains taxes on nominal capital gains, so if you buy an asset and then sell it 10 years later for zero inflation-adjusted gain, you’ll end up paying taxes on the sale. That in effect turns the inflation rate into a wealth tax. Again, though, that’s not a particularly intelligent way of taxing wealth. Last but by no means least, if you’re very wealthy we tax your wealth when you die. If you want to think about taxing wealth more heavily, it’s probably worth trying to draw some distinctions. The old argument going back to David Ricardo and Henry George that you should tax land wealth very heavily seems quite sound to me. Levying heavy tax rates on valuable land (whether it’s valuable because it’s in San Francisco or valuable because it has oil in it) does not create any bad incentives. These days, a lot of wealth consists of patents that could be taxed more heavily but should probably just be abolished. But in terms of general taxation of financial assets, the basic concept of taxing estates rather than a steady drip-drip-drip of wealth taxes seems like a reasonably sound idea. We’ve reduced estate taxes a lot over the past 15 years, which seems like a very strange policy response to growing income inequality and some evidence of capital-biased technological change.